In Anna Humphrey’s Megabat, a boy named Daniel leaves his friends, school, and home behind when his family moves to a new city. He is unenthusiastic about his creaky, kind of creepy, new house and resolutely refuses to try to make friends; that is, until he is jolted out of his loneliness by a talking bat who has taken up residence in his new attic bedroom. The two quickly bond over shared sadness and Star Wars. It turns out the bat, who is from Borneo, wandered into a shipping container and accidentally ended up half way around the world. 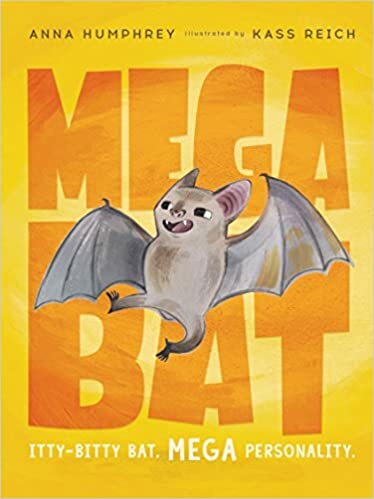 Once Daniel meets the talking bat, who he names Megabat, the central conflict of the story shifts from getting Daniel comfortable in his new home to getting Megabat home. Daniel enlists his new neighbor, Talia, to help him care for Megabat. Talia’s antisocial brother, Jaime, who is constantly at war with the local pigeon population, finds out about Megabat and threatens to tell their parents. Emotions soar as Talia and Daniel plot to help Megabat return home while pacifying Jaime, so he will keep their secret. Several failed attempts to get Megabat back to Borneo ensue. I devoured this delightful early chapter book, giggling, while feeling deeply for all the characters. Daniel and Megabat’s stories parallel, allowing Daniel to learn from his small winged friend. Children are bound to fall in love with Daniel, Talia, and Megabat. Many will likely wish for a talking bat to befriend and all will surely enjoy Humphrey’s whimsy, humor, and cleverly unfurled life lessons.